The ISTEC M-Bus module is part of the Smart Slot communications family. The technology gives the customer the freedom to choose which form of communication he would like to use and has an ideal solution for each application. The Meter Bus (M-Bus), was primarily conceived for central and remote reading of consumption meters. The M-Bus is defined in EN 1434-3 and is based on the so-called master-slave principle. The master meter requests that one or several other meters (slaves) sequentially send their data to it. Data transmission on the M-Bus is carried out bidirectional. Communication between slaves is not provided for. Within the M-Bus system, only one communication master and up to 250 slaves (measuring devices) are possible. However, expansion of the transmission network can be divided up into segments and expanded almost without limitation by means of what are known as repeaters. A two-conductor cable is all that is required for data transmission and power supply. Permissible cable routings (topology) are line, tree, and star layouts as well as any combination of these forms. Ring topology is not allowed. A bus terminator is not required. The number of M-Bus units, protection circuits, the cable routing, and the type of cable used restricts the expansion of the network and the maximum transmission speed. The M-Bus module is installed by plugging it into the SmartSlot in the measuring instrument. The module has its own processor that communicates with the measuring device. The module is powered via the M-Bus and can thus remain at the measuring point across several calibration periods. The module, as it is does not have its own has secondary address, accepts the serial number of the connected measuring instrument as part of the secondary address while reading the measured value. This read-in occurs every 24 hours after the unit's first start-up operation (the module does not have its own, battery-buffered clock; i.e., after a supply failure, the 24-hour interval recommences). Read-out can also be triggered by a command (send UD 51d0). Only the current data (present in RAM) in the respective measuring instrument can be read-out as a daily value and reference day value. The M-Bus supports almost all kinds of network layouts so that a demand-oriented topology can be selected. Star, line, and tree layouts can be selected. Ring topology cannot be used in M-Bus networks. All measuring instruments are wired directly to the central point. In the case of an error, the measuring instrument can be switched on or off to localize the defect. The measuring instruments are wired sequentially. While this is cost-effective, start-up operation and troubleshooting can be costly under certain circumstances. Due to the high voltage drop, this structure is not recommended. 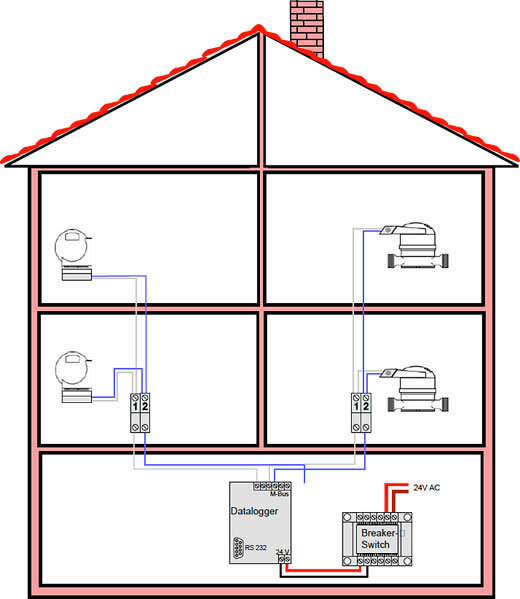 Bus configuration without data storage The M-Bus configuration illustrated below shows a system in which no data is buffered. Nevertheless, the current data as well as the reference-day value can be read out at any desired time. 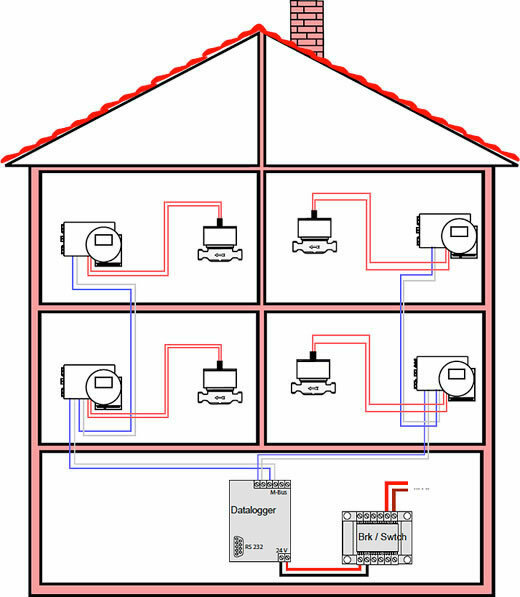 In the first case, a PC with serial interface serves for reading out on-site; in the second case, a modem is connected to the level converter. Thus, the values can be read from a remote PC by phone. For this purpose, the level converter must have a modem connection. This is a combination of star and line structures. The individual branches are created as lines so that a defect will merely affect the corresponding branch. Repeaters (signal amplifiers) are utilized to advantage in the branches and ensures additional safety and isolation of the individual sections. In this configuration, an M-Bus master suited for this and stored in memory continuously reads the measured values. These values can then be read once again on-site using a PC or via the modem. This procedure has the advantage that interim values are also present and corresponding intermediate readings and calculations are possible. The total bus system expansion is essentially restricted by the number of M-Bus units in the segment, the distribution of units in the bus segment, the resistance of the bus line utilized (voltage drop on the bus line) and the speed of transmission. The expansion of the transmission network can be divided into segments using repeaters and is expandable to almost any limit. That means all M-Bus units connected to the same repeater or level converter belong to the same M-Bus segment. Up to 250 terminal devices can be connected to one separate repeater on one segment. Simple application examples with a level converter for a maximum cable capacity of 150nF/km are listed in the following table. M-Bus uses only 2 conductors for data transmission and supply of the meters. Reversing the two-bus conductors is allowed and does not cause an error. The M-Bus is thus the bus requiring the least amount of wiring. The stated number of units in M-Bus Systems is always based on a current consumption of 1.5mA per unit. As this bus current, is not always sufficient for high-quality metering systems, individual M-Bus units can require more current from the bus. This reduces the maximum number of units that can be operated in one segment. Standard lines, such as those used in communications technology, can be used for wiring. Recommended is 2-conductos, +M and -M (twisted, not shielded). Whenever possible, 2-core, twisted cable should be employed, as it possesses the best transmission characteristics. The use of shielded cable over long distances leads to signal distortion due to the higher transmission line capacitance. A suitable distribution box must be provided and installed by a qualified electrician. The M-Bus device must than be wired up in this distribution box. In order for the M-Bus units to be addressable, they must be given an ID – an “M-Bus address.” This address is divided into a primary and a secondary address. The Primary Address is intended for fast device access. It consists of a number from 1 to 250. This number can be allocated to any M-Bus subscriber. The meter can then be addressed and read using this number. If two or more units have been allocated the same primary address, a collision will occur during direct reading as several units try to answer the master simultaneously. The secondary address was created for such a case. It is device-specific and normally corresponds to the serial number of the unit. In its entirety, the secondary address consists of the serial number, the manufacturer ID, version, and type of device. By setting the primary (253) and secondary address, each device can be specifically addressed. As the secondary address consists of 8-digit positions, the probability of a coincidental match is very small. In addition to the identification described above, each device has a manufacturer ID. In MX, this is BER. Other manufacturer designations are, e.g., REL = relay. The primary addresses 0 and 251 to 255 are reserved for special tasks, and should not and cannot be used for device addressing. The address 0 is used for the device initial state; i.e., the device has not yet been addressed and put into operation using this number. 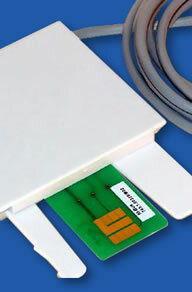 The M-Bus modules are also supplied with the primary address of 0, unless the customer has requested otherwise. The M-Bus is based on European standard EN 1434 as a normed interface for calorimeters and is used for the teletransmission of meter data. The normed data protocol is dealt with in Part 3 of EN 1434. 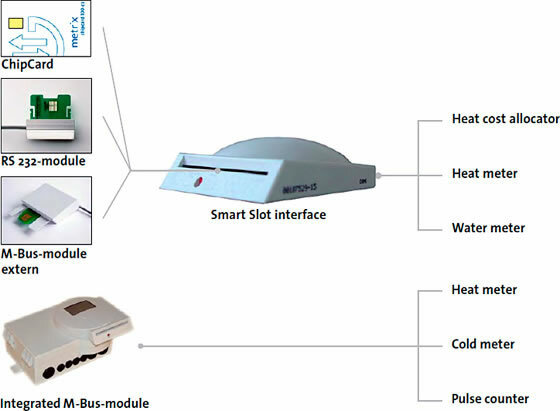 Apart from calorimeters, water, gas, and, electricity meters can sometimes be equipped with M-Bus. M-Bus has been standardized since 1997. Meters that were supplied with M-Bus interfaces before this date do not fully correspond with the standard. Search for primary and secondary addresses After that, the search for modules can be started. Initially, all primary addresses are queried and tagged as free, programmed, or multiple allocations. After that, the secondary addresses are searched and listed. Addressing the device (allocation of primary address) In the following steps, these modules can now be allocated with a freely programmable address. Reading the initial value Finally, the current memory content of the measuring instruments is read from each module. Write a project list After completion, a list should be compiled in which the primary address, the corresponding serial number (secondary address), type of device, the initial value, and the installation location is apparent. See our Glossary for additional assistance.